I was delighted when Crisis Control Ministry asked me to do a painting for their new Honor and Memorial Card. 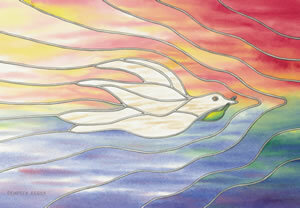 I wanted an image of a dove that was different from what they had used and I liked the idea of the stained glass appearance. The painting depicts Noah's dove with an olive leaf in its mouth as it flies through the rainbow returning to the ark, bringing the light of God's promise into a dark world. Crisis Control Ministry was established in 1973 by six downtown Winston-Salem, NC churches to create a comprehensive system of response to the emergency needs of people in Forsyth County. Since that time, Crisis Control Ministry has grown to over 300 supporting congregations, over 500 volunteers, and a budget of over $2 million. Through the years, the Ministry has helped birth the Samaritan Soup Kitchen, Habitat for Humanity and the Second Harvest Food Bank of Northwest North Carolina. In 1987, the Ministry opened the first state-licensed free pharmacy in North Carolina. Through the support of grants and foundations, churches, individuals, business partners and special projects such as the Dempsey Essick Honor & Memorial card and its signed, limited edition prints, the ministry is able to continue its mission: to assist people in crisis to meet essential life needs and become self-sufficient. The Crisis Control Ministry is located at 200 E Tenth Street in Winston Salem, NC. For more information you may visit their website at www.crisiscontrol.org or reach them by phone at 336-724-7875.